In 2018 was produced vessel Elan Impression 50 called Alegria I. This sailboat is based in port Biograd in surrounding area of Zadar in Croatia. You can board up to 13 passengers on the vessel Alegria I. Layout of sleeping places is 13 (10+2+1). There are 6 bedrooms situated below sailboat's deck. Alegria I is equipped with 2 heads with showers. Find about more offers by moving to this section: Yacht charter Zadar. In this vessel is applied motor 80. 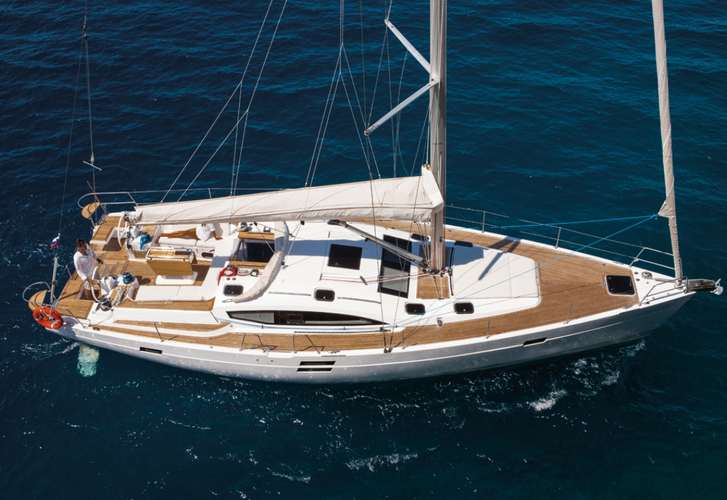 With 15.20 m of lenght overall and 4.68 meters of beam Alegria I provides enough space for comfortable sailing. Elan Impression 50 Alegria I is equipped with: Anchor electric windlass, Dinghy, Bimini top, Gps plotter, Autopilot, ipod system, Plotter gps in cockpit, Bow thruster, Air conditioning, Heating, CD/MP3/USB player, TV, Freezer, Furling mainsail. . Deposit accounts for 2500.00 EUR. Read about more yachts by opening this link here: Yacht charter Biograd.